Gas turbine manufacturers advertise efficiencies over 62% (heat rate = 5.50MMBtu/MWh), but such figures are realized only under test conditions. In reality, the average combine-cycle gas turbine ran at 44% (7.75MMBtu/MWh) in 2017. Advances in turbine technology are allowing a new crop of hefty and efficient gas-fired power plants to outperform their peers. 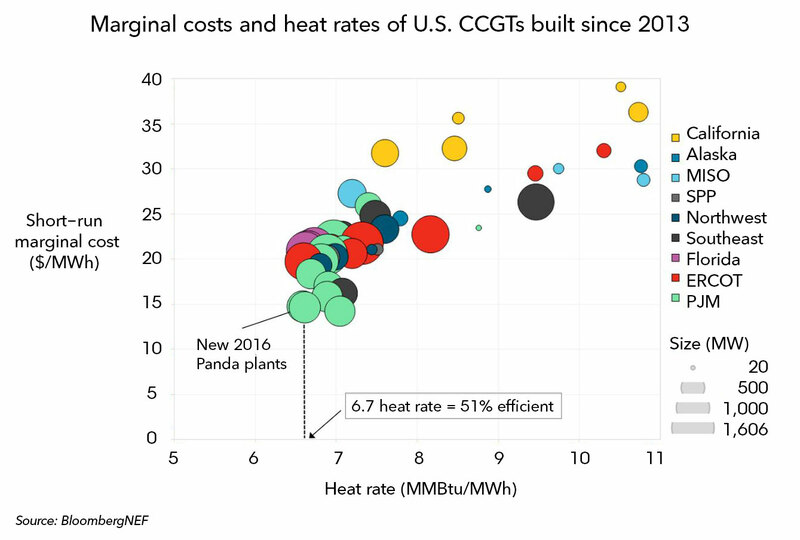 For example, the latest generation and fuel burn data compiled in Bloomberg NEF’s U.S. Power Plant Stack shows that two new 870-megawatt plants owned by Panda Power Funds recorded efficiencies above 50% (6.82MMBtu/MWh) in 2017. High efficiencies and cheap gas helped push short-run marginal costs for these plants below $15 a megawatt-hour. Short-run marginal costs that low easily beat those of coal in the majority of the hours in the year.